We script testing, deployments, delivery, build, packaging. So why don't scripting provisioning? Cobbler allows you to transform a set of bare metal machines into a cluster of machines with the wanted flavor of the day. Select the OS image, your kickstart scripts and cobbler will orchestrate the install via a net boot install. The machines will connect to the cobbler via dhcp auto discovery boot loading using pixie. Where to go from there, is only up to you. :) . For those of your who are aws savvy, cobbler fill the same role of cloud formation at amazon. 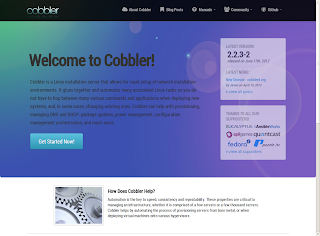 The analogy ends there, since cobbler will provide boot networking and distributed provisioning on the bare metal, while aws cloud formation is instantiating virtual machines and interfaces, on top of the available amazon data centers nodes.